Led by Saina Nehwal, Hyderabad Hotshots defeated Awadhe warriors 3-1 to lift the crown of the inaugural Indian Badminton League at the NSCI Stadium on Saturday. 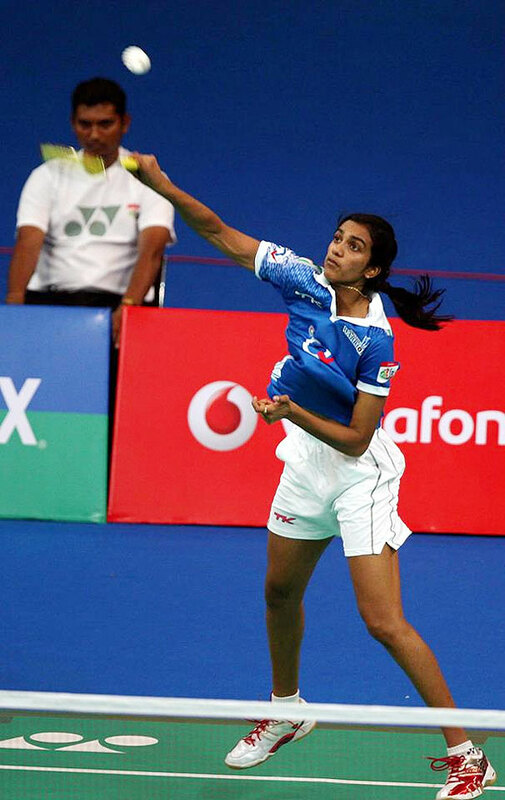 Indian shuttle queen Saina brought the Hotshots on level terms by trouncing her young challenger P V Sindhu in straight games 21-15, 21-7 in 35 minutes after K Srikanth gave the Warriors an unexpected 1-0 lead by stunning top-20 rival S Tanongsak in straight games, 21-12, 21-20. Hotshots surged ahead again after Saina’s thumping win when their top Malaysian men’s doubles team of Goh V Shem and Wah Lim Khim got the better of the scratch Danish-Indonesian pair of Mathias Boe and Markis Kido in three games 21-14, 13-21, 11-4. Later Ajay Jayaram did the star turn for the Hotshots with a wonderful turnaround when he got past R M V Gurusaidutt after dropping the first game. Jayaram, ranked 24th in the world, beat 20th ranked Guru 10-21, 21-17, 11-7 in 52 minutes to help the Hotshots win the top prize of Rs 3.5 crore. Warriors took home Rs 1.75 crore. Earlier, Srikanth shocked Thailand's Tanongsak, ranked 19 places above him in the world, 21-12, 21-20 in 38 minutes to put the Warriors 1-0 ahead. However, any hopes of Sindhu making it a commanding 2-0 lead for the Lucknow-based Warriors vanished into thin air as she was overpowered by her more experienced opponent in the eagerly awaited battle between India’s top two woman shuttlers. Saina, who had beaten the taller Sindhu when the two met earlier on August 15 in the league stage of the event, smashed and dropped her way with impunity to win the one-sided contest 21-15, 21-7 in only 35 minutes and helped the Hotshots square the contest 1-1. Playing in front of a packed house, the 23-year-old London Olympic bronze medallist took an early 7-3 lead before Sindhu narrowed the margin to 7-8. But Saina came up with some fine body smashes and drops to surge to a handy 14-9 lead. Though Sindhu scored two points when her more experienced opponent committed unforced errors, she couldn't prevent Saina from going to 20-12 with a net dribble and closing out the game with a smash. The second game was even more lopsided, as Saina, unbeaten in the tournament, stamped her superiority with a punishing array of shots. She took commanding 7-1 and 13-4 leads and then stepped up the pace to completely dismantle the 18-year old World Championship bronze medalist’s game, winning the last two points with a smash and a drop. The Warriors then looked set to level the rubber for the second time when R M V Gurusaidutt overcame an error-prone Ajay Jayaram in the opening game. But Jayaram, who trailed his rival 4-7 in the second game too, staged a splendid fightback from 10-14 in the second and caught up at 17 with a drop. He then went ahead and scored three more points to clinch the game with a jump smash. In the third, Jayaram surged ahead from 5-all and never looked back to seal the issue. He smashed well when in sight of victory and took the last point with a drop shot. In the first match of the day, Srikanth rattled his higher ranked Thai opponent with his aggression, both in front court and back, to complete a shock victory. After trailing initially, the Indian youngster caught up at 4-all and then led all the way to win the first game 21-12 in 14 minutes. Srikanth, ranked 38th in the world as compared to Tanongsak's 19, was also the superior player at the net on the day while also executing some brilliant cross-court jump smashes. Tanongsak made a splendid recovery in the second game, reaching to game point from 8-14 down, before Srikanth got back the serve to take the match to 20-all and then hit a half smash winner close to the sideline to clinch the match and give the Warriors a 1-0 lead.